We closed on our house on Friday. Our shipments (United and U-haul boxes) are still in Salt Lake City. We're tentatively scheduled to receive the main bulk of stuff in 2-3 weeks, although we have a guest bed and mattress coming today or tomorrow. In the meantime, we have had a nice place to stay at DBIL's, while we work on the "new" house. We went there on Friday afternoon. Rocky (his blackness barely visible at the base of the stairs by the hot tub) and Dusty explored the backyard. Most of the trees are huge junipers, loaded with berries (good for making gin, if you like that, but also an ingredient in Sauerbraten, which I could make with faux meat). Dusty hasn't figured out the dog door yet, but Rocky rejoiced in it, being familiar with it from his puppyhood. He went in and out. The pups played in the backyard, rolling around in the grass, something they couldn't do in our old backyard. 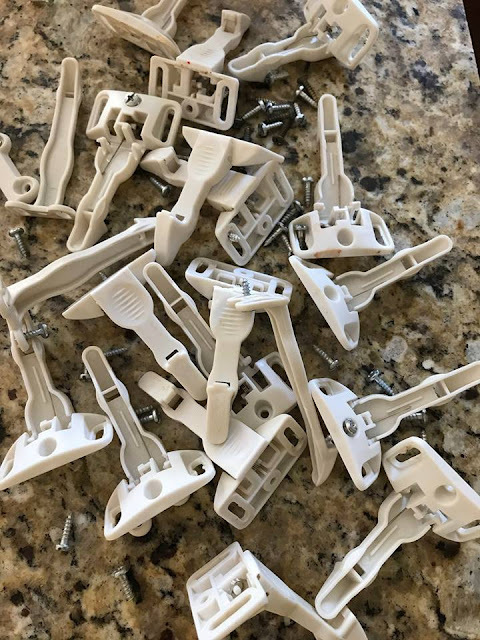 I spent a good part of Saturday removing the childproofing latches on the kitchen drawers and cabinets. I found two more I had missed after I took the above photo. Many of the drawers had two latches. Here's a photo as proof, looking down into the drawer. There must have been a Houdini wannabe living in this house at some time. Our younger DIL said we may have removed the latches 1-2 years too early, but I disagreed, as we have recently purchased a taser from Amazon. (Just kidding.) If Johan wants to get into my spices and herbs, he will find them less interesting than some of the "herbs" you can buy here in Oregon. I brought the girls with me on Saturday, and they are the first "beings" in the family to stay there overnight. They look nice on the windowsill in the kitchen eating area, although they will have less trouble getting up there once the bench from our former dining room is along that wall. I think the house and grounds offer a lot of opportunities for illustrating the dolls' stories. I'm still working on getting a boy. Many lights were burned out or (as in the case with the refrigerator) simply not there. The last or some former occupants had used bulbs with a wattage unsuitable (as in too high) for the fixtures in some places, and there were signs of shorts (the electrical kind, not the kind you wear) and perhaps the start of a fire...or two. Some light bulbs were missing the glass bulb part, and the part you screw in was still in place. It's a good thing I married the son of an electrician. He knew to turn off the circuit before using my quilting hemostat to grab the base of the now-non-existent bulb and unscrew it enough to finish by hand. The items we still have left from the decorative stuff on the top shelf in the Utah photo (we gave a lot away) can go on top of the cabinets in the new house, and maybe the canisters of beans and things as well. Ah, the cabinets! We have come to the conclusion that the only hope for them is to have them professionally painted. 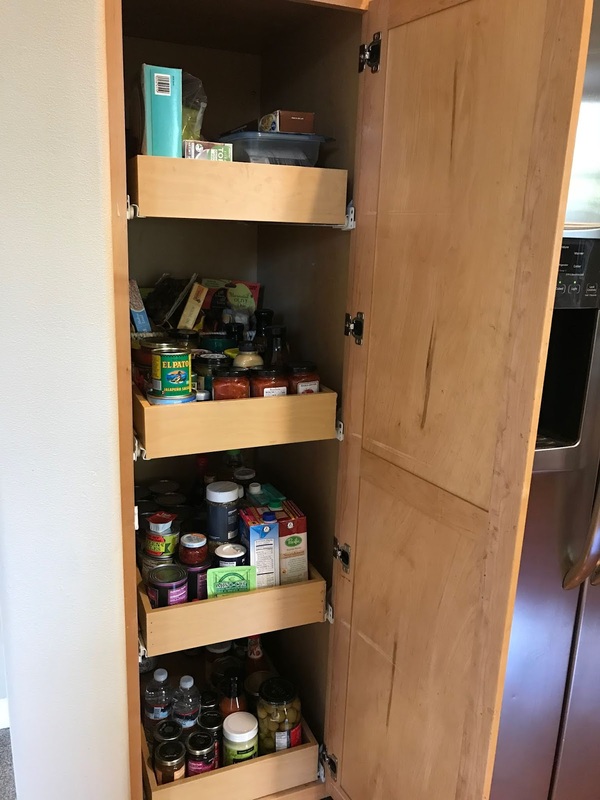 We are certain that the parents of the Houdini wannabe were Mr. and Mrs. Jellyfingers, because every cabinet door was sticky. We also think that they had a flood at the sink at one time (based on damage to floor and sink cabinets). Every one of the cabinets also had the finish removed in places and/or gouges in the wood. 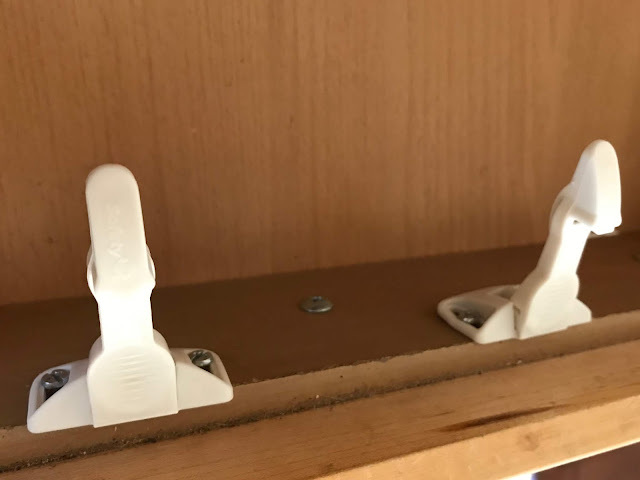 The shelf-support pegs were missing in almost every cabinet that had a shelf. I don't think they make that size anymore. One quickly dashed ray of hope came when we thought we had found the manuals for the appliances. "Quickly dashed" because the fridge is a GE, not a Frigidaire, and the installation instructions aren't much use after the microwave has been installed. However...I'm looking forward to the GE microwave manual as my bedtime reading for a night or two. We don't have Internet yet at the new house, but manuals are pretty much all available online these days. 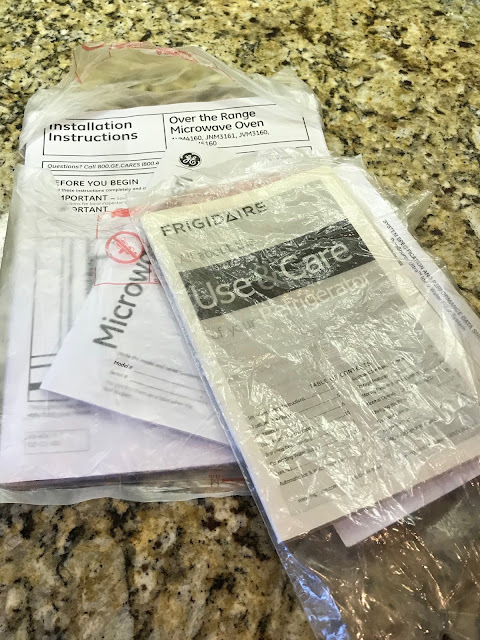 We will download manuals for the other appliances as we can. The stove has about 1/8" of grease on the grates, with hair and possibly paper fibers stuck here and there. I'll have to take them to the tub upstairs to give them a good soak and then have a go with a steel-wool soap pad (or two or three). The oven doesn't look too bad, I appeared as if the self-cleaning cycle had been run. I hope it keeps the right temperature. 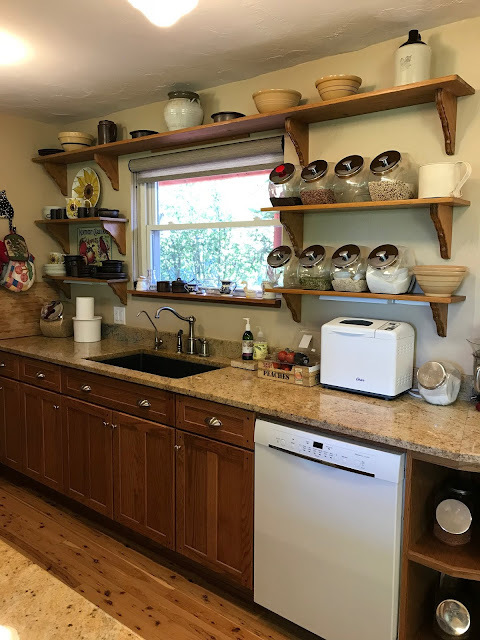 We bought a tall kitchen ladder, which we needed to change the light bulbs, and raise and lower the shades downstairs (Levelor cellular cordless). The hook thingy you use to raise and lower the shades above your reach by putting it through the hole in the tab at the center of the shade, was surprisingly missing, and apparently they don't make them any more. We're going to have to make one from a long dowel and a cup hook. Why don't we need the ladder for the window coverings upstairs? There are no window coverings upstairs. Nada! Well, there were some blinds in what will be our guest room upstairs, but there was no way to raise or lower them, as someone (probably that Houdini wannabe) practiced their macrame with the cords, so we took them down. We still have some packing paper from our move, so I can cover the front windows until we can get some shades put up. I don't think anyone can see into the windows from the back of the house because of all the evergreen trees. The house will be a lot of work, but we could tell that when we walked in for the first time. Our offer reflected the cost of what we knew we needed to do to it and what else we suspected might be needed. I think it will be nice when we get done, and we will love it more for having had to do the work. 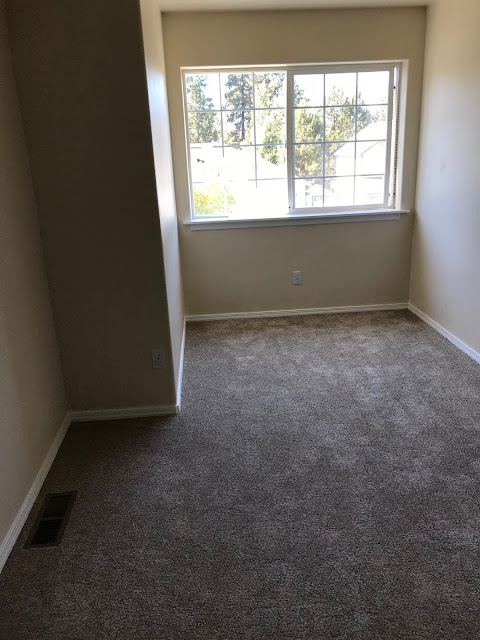 I wouldn't have put in all that carpet, but at least what they chose is tasteful and almost practical. We are enjoying the parks and trails here, though. 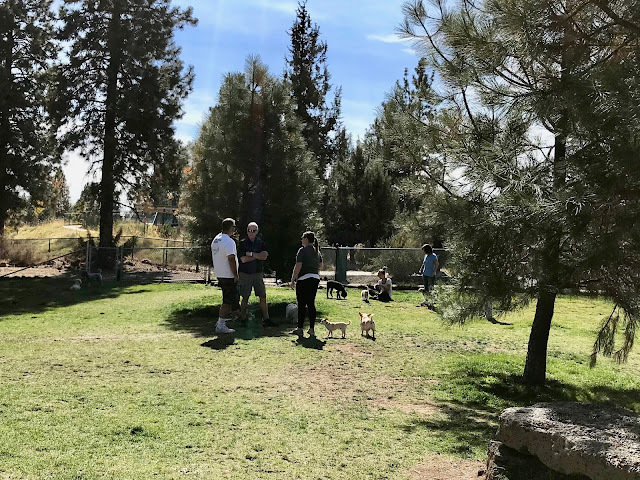 Here's a gathering in the small-dog section of the dog park at Ponderosa Park. We also can get on the Larkspur Trail from our "new" house that goes all the way to the base of Pilot Butte. (This hike was from DBIL's house.) The green pin indicates where we started, and the red pin indicates where we stopped, at DBIL's house. 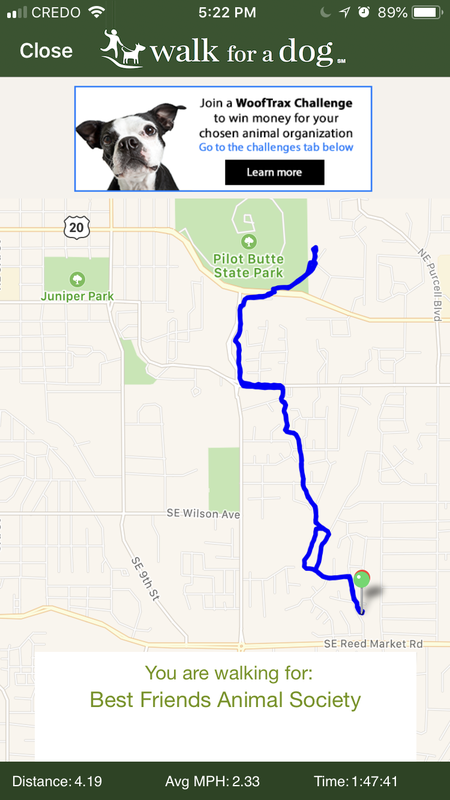 On the map, our house is located on the right-hand side of the loop that shows that we took the trail on the way out but walked back along the street so we could check out our new neighborhood. Ponderosa Park, where the dog park is, is that patch of green at SE Wilson Ave., just a couple of blocks from the trail. Some day we might take a picnic and go all the way to the top of Pilot Butte. It should be easy, compared with what we've been doing. 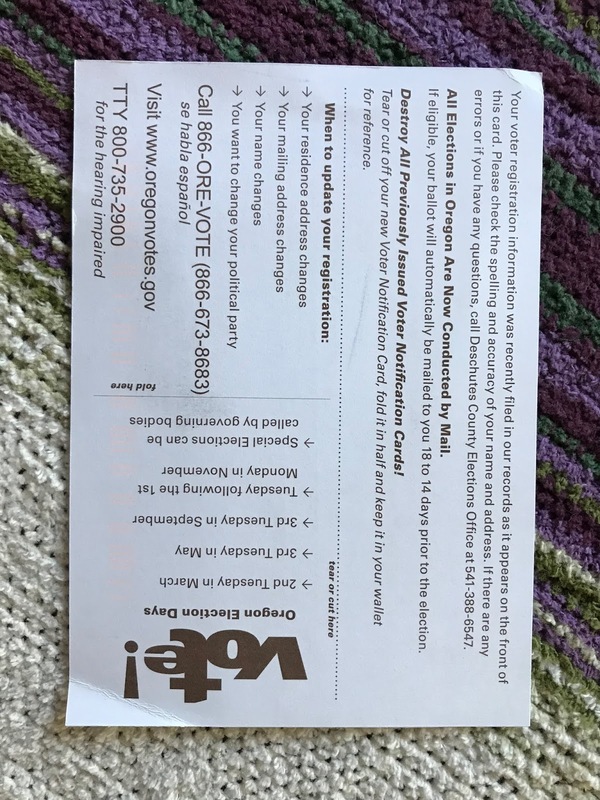 It's surprisingly easy to register to vote in Oregon. They use your Social Security number if you don't have a driver's license yet. I'm sure they let Utah know I wouldn't be voting there this time. My registration card came in the mail. DH can ski again this winter. I gave him the senior locals' pass for his birthday. He didn't ski the last two years we were in Park City, because Vail had taken over the ski areas and raised the price on passes, doing away with the seniors' discount for locals. For the amount of time he likes to spend skiing, it was no longer worth it. Now I'm trying to figure out how I will be doing my sewing my sewing room. I'm thinking of a Mod Squad corner sewing table (for my Sparrow 15) and another Mod Squad cabinet next to it for my Featherweight. These two pieces should fit in the alcove in my new fiber studio. I think I can add a compatible cutting surface on the other side of the corner unit, using a stock bathroom vanity with my 3/4" frosted plexiglass panel and my cutting mat (being brought by United) but it will be higher, of course, to allow for cutting comfortably while standing. DH will have to build a shelf to hold the lights I will use when I need to use it as a light table by removing the cutting mat. I think I'm going to need a plastic mat to go under my desk chair, as it will be hard to roll around on the carpet. If anyone has had experience with the Mod Squad pieces from Connecting Threads I'm considering, I would love feedback. Did I mention we have lost our "parts box" somehow. It's where we put all the screws, shelf pegs, keys and remotes (!) from our move. I hope it shows up, or we have several hundred dollars of locksmith and remote-replacement expenses ahead of us. This will look good in my autobiography someday. It will be fun to look back on it...instead of still anticipating a lot of it. What's on my needles: A couple more rows on the Coastal Skies Shawl. Not much time to do anything. What's on my Sparrow 15: Now sitting in my new sewing room, waiting to have something to sit on for now, perhaps the craft table we use for our trailer. What's in my hoop: Still the Spring Flowers quilt, a little more progress this week. 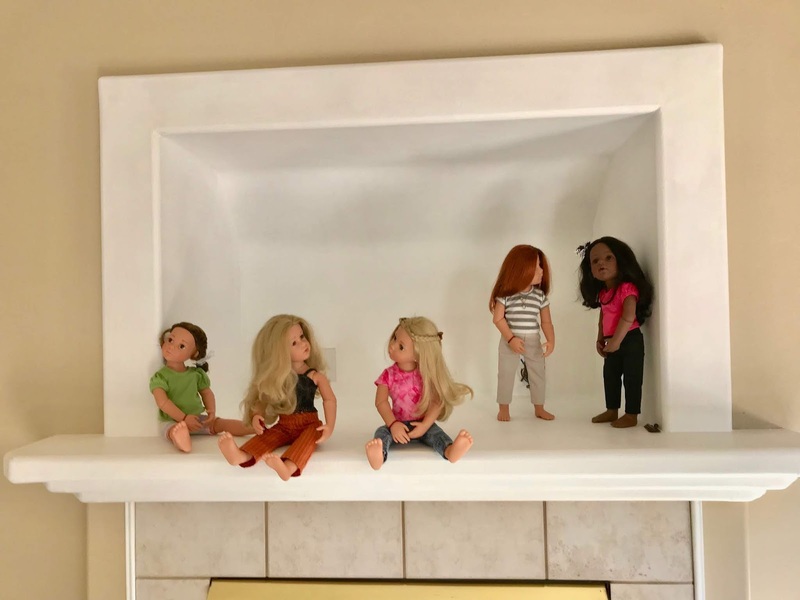 What's in The Doll's Storybook: Being Little, the second episode with Mariah. (Mariah is a smart biscuit.) I'm scheduled through October 12th, with the next one after that in the writing stage. What's on my iPad/iPhone: The Innkeeper of Ivy Hill by Julie Klassen. I've made a little more progress with the story. What's my tip of the week: When you remove those child-proofing latches from a drawer or cupboard, you only need to remove the front (hook) part of the latch. That's the part that keeps the drawer or cupboard from opening. The other (inside) part of the latch is much harder to remove because of the location, and unless you plan to using or selling the latches, they don't need to come out. Note: This blog post was produced on the iPad and the MacBook, using the iPhone for some photos and some photo processing. No other computer was used in any stage of composition or posting, and no Windows were opened, waited for, cleaned or broken. 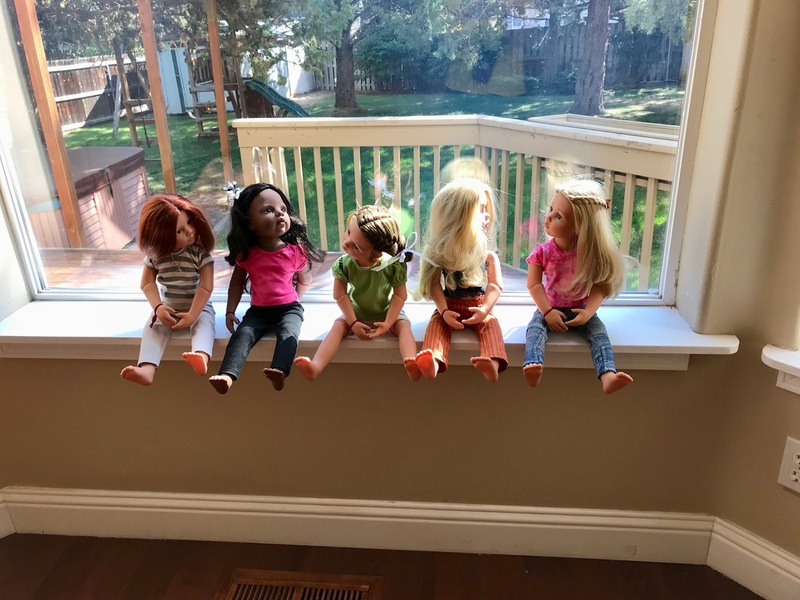 No animals or dolls were harmed during the production of this blog post. At my age (some days I feel older than dirt!) pot is definitely not on my radar, but I'm happy that it has finally been de-criminalized. As legalization is looming, a lot of the provinces haven't actually got in place how they're going to control it. Currently, here in BC, only the city of Kamloops will actually have a 'store'. The rest of the province will gradually get it organized, I guess, but it won't have any affect (effect? I never get those right) on me, so I just kind of shrug and let it all happen. Times they sure are a-changin'. LOL! I think a lot of it is deferred maintenance, but the last two years the house was rented. I think renters can be especially hard on a house. We bought a nice condo in Park City while we were living in Indonesia. It was beautiful when we bought it. Three years later, when the current renters moved out and DH was forced into early retirement from his job, we decided to go live there. It was a mess. This one was probably very nice, too, other than little things needing fixing. I have no interest in pot, but I'm not against other people using it, as long as they don't drive while under the influence and don't blow smoke in my face. Utah is voting on medical marijuana this year. They're one of the most restrictive states in the US. Grocery stores can't sell alcohol above 3.2%, except for vanilla extract, of course, and rubbing alcohol, which should not be consumed. It's so nice to be able to buy wine at Trader Joe's, Costco and the regular grocery stores. Pot becomes legal in all of Canada on the 19th of October. (I think I got the date right) but access will be through special stores, depending on the Province. As we can't buy any kind of liquor in grocery stores, it's obvious that we have some pretty restrictive laws here in B.C. and cannabis outlets will have some serious hoops to jump through before they can open a storefront. The previous occupants of your house must have been somewhat strange. Did they live in the dark or did they just remove or destroy all the light bulbs before moving out? I've heard of people doing that but really! That's something I can't imagine ever doing. 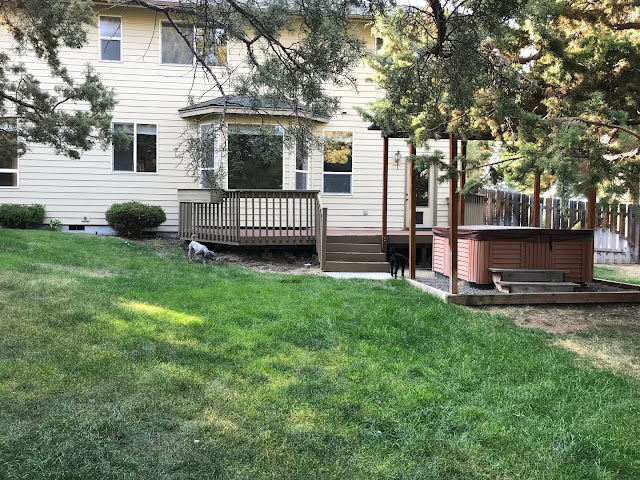 It does though, look like a really nice house and what a wonderful yard for the pups! I'm sure you're going to love living there.